McGraw Hill’s Business Value of BIM for Construction in Major Global Markets SmartMarket Report 2014 was released a few days ago. The press release can be found at this link. Alternatively you can visit the store to download it for free. While Building Information Modeling (BIM) is rapidly expanding around the globe, there are significant differences between construction companies’ experience with and business benefits from BIM in various regions. 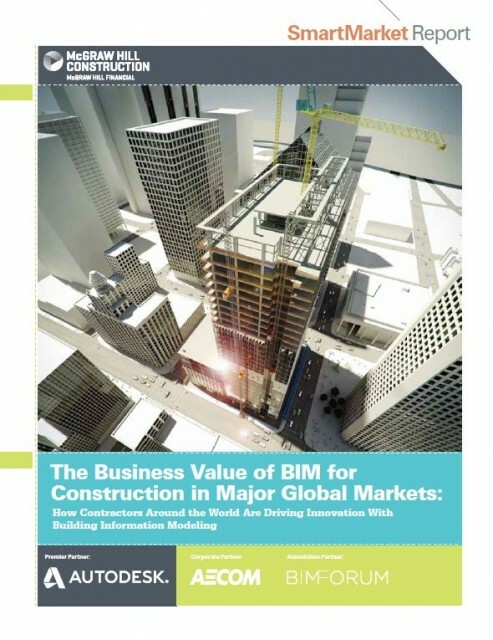 This study builds upon McGraw Hill Construction’s investigation of BIM in individual markets, including North America, Europe and South Korea, to demonstrate larger trends globally through data from contractors in 10 countries: Australia, Brazil, Canada, France, Germany, Japan, New Zealand, South Korea, UK and US. I haven’t had time to review it in any detail yet but Australia/New Zealand seem to be in the middle of the field. It should make an interesting read. I’ve got several theories on how we can improve BIM use by contractors, but I think that discussion is best left for another day. betterRevit encourages BIM throughout the building life cycle!